Go for it! 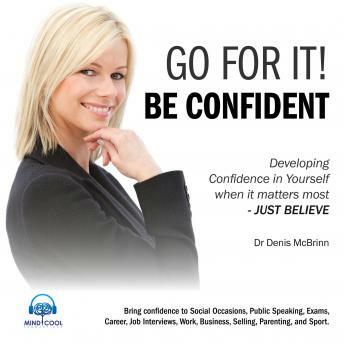 Be Confident, is designed to help you develop the confidence to succeed in all areas of your personal and working life. Confidence is the key to a happy and fulfilling life and it has such an impact on how we perform in every single area of life. As a professional Life Coach Denis McBrinn is often asked how can we get more out life and achieve the best possible life we can. No matter what the challenge or situation, confidence and self-belief can be said to be two of the most important factors for success. The purpose of this programme is to empower you to take practical steps along the road to greater confidence in all aspects of your life and to help you make a real difference where it matters most. It will introduce you to the skills and mind-set that successful athletes, sport stars, actors, artists, inventors, politicians and business people have developed to create confident and fulfilling careers and lives.